Since there is never just a single direction or period for ocean waves, we can only measure the peak period (Tp) and peak direction (Dp). The peak period is the most common period between consecutive waves, while the peak direction is the most common direction. To come up with these values, all of the wave energy for a station over a specified period of time - approximately 30 minutes, in most cases - is grouped into different bands. For instance, in CDIP’s 9-band products, all waves with periods from 6 to 8 seconds go into the 7-second band, those from 8 to 10 secs go into the 9-second band, etc. After all of the wave energy has been divided into these bands, the band with the most energy is selected as the peak band. So which Tp/Dp values are better? It depends what you’re looking for. For instance, the broad bands of the 9-band values are better for addressing general questions about the sea state (e.g. which is currently predominant - local seas or ground swell?). To pick up more subtle features - like the arrival of long-period swell from a distant storm - the parameters values may be more helpful. Very often waves from different parts of a distant storm arrive here at the same time. Their period (or lengths) can be nearly the same size. For a while the crests of the two wave trains begin to coincide. The two trains adding together result in waves that grow bigger. Later, the troughs of one begins to coincide with the crests of the other. The combination wave grows smaller. We see this as a “set” of large waves, followed by an interval of smaller waves. See figure below. Local winds generate very short-period, high frequency waves, and not all of CDIP’s instruments can measure these waves effectively. This is especially true of pressure sensors postioned deep underwater. At Kings Bay, for example, the sensors are mounted at a depth of 55 feet. Due to attenuation, these sensors do not feel high frequency waves, and so on windy days the high frequency energy will not be reflected in the reported Hs. Why are the times on your buoy data often an hour or more old? Can’t the data be more up-to-date? To determine the wave conditions, you can’t simply look at the ocean for a few seconds. Instead, you need to sample data over a long period. 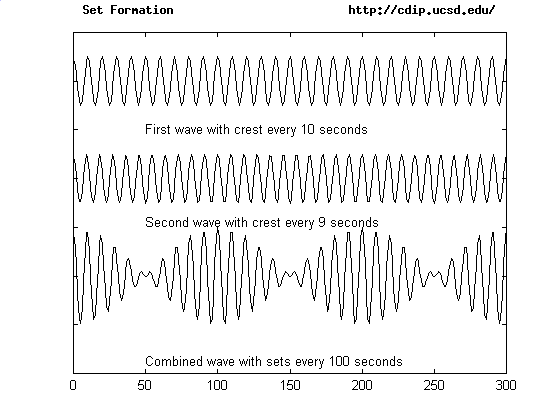 For most of CDIP’s wave calculations, a data sample of approximately 30 minutes is used. And unlike the NDBC and other data providers who use sample end times on their spectra, CDIP uses sample start times. This means that when we update our site based on a data sample that ended just a few minutes ago, the time assigned to the data - the start time - will already be more than 30 minutes old. For Datawell buoys, at the end of a 30-minute sampling period, the sensor calculates a wave spectrum and starts to transmit it; it’s repeatedly sent in 4-minute blocks over the next half-hour. When looking at buoy data, it’s important to distinguish between deep-water measurements and shallow-water measurements. In deep water, swell direction is primarily determined by the location of the fetch that produced the swell. So deep-water buoys on the West Coast register swells from the Gulf of Alaska as NW swells, and swells from the South Pacific as S or SW swells. In shallow water, on the other hand, the swell direction is determined primarily by the local bathymetery; swell is refracted such that wave crests approach the coast parallel to shore. I.e. whether it’s a NW swell or S swell, at your local beach the waves always come in and line up at nearly the same angle, with only slight shifts to the N or S.
For example, the San Francisco Bar buoy is a shallow-water buoy at a location where the shore normal points to the WSW. Thus all long-period swell, regardless of source, has been refracted to the WSW at that spot. So the readings you see are correct given the water depth (15m) at the buoy’s location. Sometimes the swell and wind wave heights reported on the NDBC site for CDIP buoys aren’t consistent with neighboring NDBC buoys. The CDIP buoys report larger wind waves, while the NDBC buoys report more swell. Why is this the case? Sometimes there are significant amounts of wave energy with periods in the 8 to 10 second range. Depending on wind conditions, NDBC may report this energy as swell, whereas CDIP buoys will always report it as wind waves. Hence the NDBC reports will show more swell, and the CDIP reports will show more wind waves. By looking at the swell and wind wave periods, however, it should be clear when this sort of discrepancy occurs; the NDBC buoys will be reporting a low swell period, one that falls below CDIP’s 10-second cutoff. For a more in depth discussion of wave measurements and standards, we recommend the Coastal Engineering Manual (CEM) published by the United States Army Corps of Engineers’ Coastal and Hydraulics Laboratory.